Chickens with red skin. This is a picture taken in 2017 in Japan. The reason why their skin gets red is because of the errors that take place at slaughterhouses. 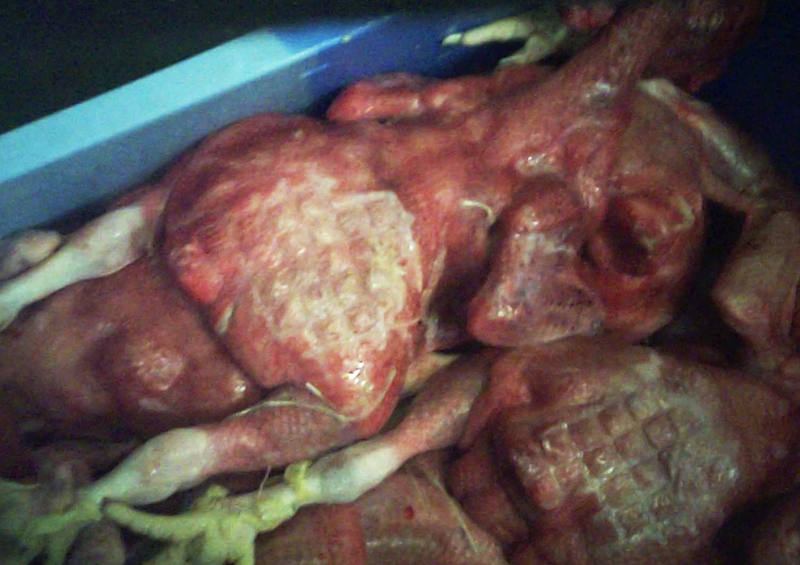 Their necks often don’t get slit properly, and as a result, the birds are boiled alive. In other words, these are “accidents,” and the birds’ lives, sufferings, and pain get tossed away as though nothing occurred. Many slaughterhouses kill birds by slitting their throats without stunning by utilizing electronic shock or gas to knock out birds first in Japan. This method is illegal in EU. In this case, chickens are hung upside down, and have their necks cut by a machine called an “auto-killer” or by human hands. Since the birds are conscious, they struggle by flapping their wings or they raise their necks. In doing so, their necks are accidentally come off from the auto-killer. Consequently, the slit is too shallow to kill the birds or even worse, their necks don’t get cut at all. If we watch the video, the slit is often really shallow. The bleeding period is about 2 to 3 minutes and they have to bear the pain from being slit for such a period of time. 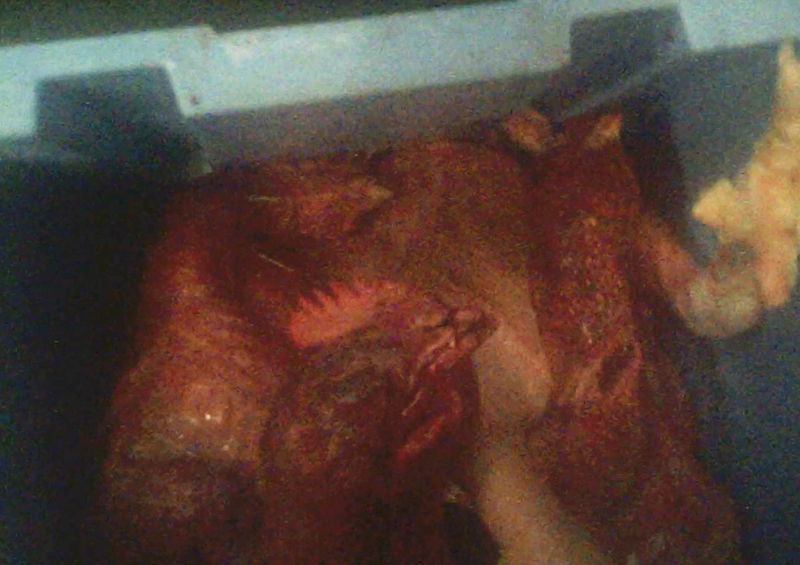 Afterwards, the hung birds are put into hot water at a temperature of 60 degrees. With the pain and heat, they will die of burn or suffocation. We can see the birds kicking their legs in the hot water. This is a common method globally, and practiced at some slaughterhouses in Japan. That is to knock birds out by diving their heads into an electronic bath, then slit their necks. In this case, birds suffer less because they don’t have to experience the 2-3 minutes of pain after their necks get cut as they do without stunning. However, if the voltage of the bath is too low, birds are still conscious, and sometimes they raise their heads up. In doing so, they get slaughtered while being conscious. This error is not uncommon so many European and US companies are shifting to use stunning by gas. Also, this method does not kill birds so birds can recover after a while. If they are not bled out completely when they are put in the hot water, they will most likely experience the same pain as when they do without stunning. Every effort shall be made to ensure that no conscious or live birds enter the scalding tank. All animals should be bled out by incising both carotid arteries, or the vessels from which they arise (e.g. chest stick). However, when the stunning method used causes cardiac arrest, the incision of all of these vessels is not necessary from the point of view of animal welfare. It should be possible for staff to observe, inspect and access the animals throughout the bleeding period. Any animal showing signs of recovering consciousness should be re-stunned. After incision of the blood vessels, no scalding carcass treatment or dressing procedures should be performed on the animals for at least 30 seconds, or in any case until all brain-stem reflexes have ceased. Also, there is usually a checker standing by the water bath to confirm death of birds in the EU and the US, while there is no such practice or the quality of confirmation is very low if there is any checker at all in Japan. You can tell how bad the quality is by seeing the number of victims. Article 40 (1) In the case where an animal must be destroyed, a method that minimizes as much as possible the pain and distress to the animal shall be used. Methods of animals that must be slaughtered shall be through chemical or physiological methods that may make the animals unconscious or stop the heart or lungs of animals in order to minimize suffering of them. Otherwise, the methods must be something that is accepted by the society. It is clear that it’s not a method that the society accepts to kill birds by boiling alive. Ratio of accidents is 0.05% for broilers, and 0.19% for adult hens. However, you will get to see a full picture when you see the actual numbers. 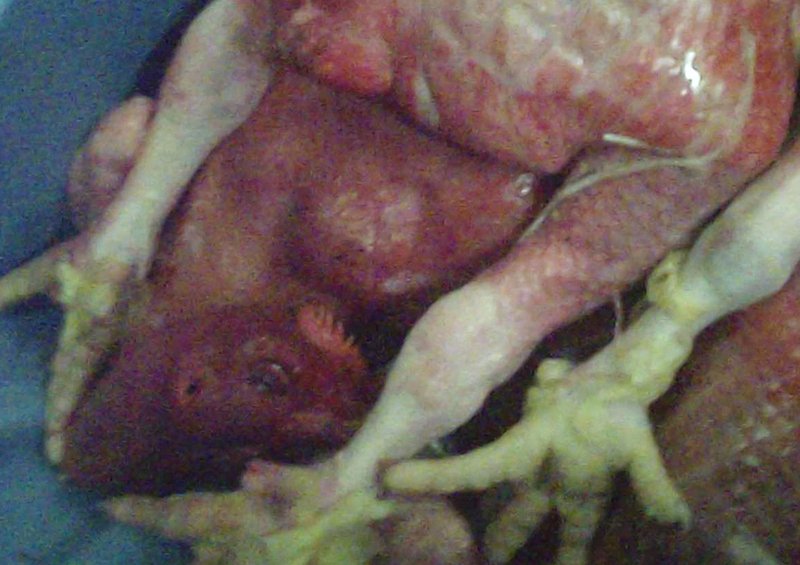 346,354 broilers, 152,538 adult hens, and 498,892 birds in total were boiled alive in 2016. “Failure of Bleeding” is often referred to as “Cadaver,” “red skin,” or “cherries” in English. It is unlawful to have this “accident” in the UK and Sweden so it’s assumed to be zero. Therefore, there’s no statistics available in these countries. The U.S has its numbers. In the U.S, the number of slaughtered birds is about 10 times higher than ones in Japan. The speed of the slaughtering line is also really fast, and thus, there are many accidents. So it’s Japan = 0.648% (no tendency of decreasing) vs US=0.0067% (dropped significantly). Birds are 9.6 times more likely to be boiled alive in Japan than in the U.S. It is possible to improve the current situations by making sure confirmation of death works properly, and by shifting the current methods to stunning gas. The number of killings is about one tenth, and speed of slaughter line is a lot slower in Japan than the U.S.
With that said, it would not be too hard to make this accident non-existent just like the UK. It is the laziness by the Ministry of Health, Labor, and Welfare, as well as corporations to ignore such cruel death that is to kill birds by boiling alive.